Home / HEADLINE NEWS / FG spends N49bn on school feeding programme, suspends Benue, Niger officials (Find Out Why) ! 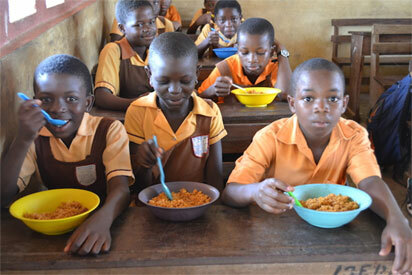 FG spends N49bn on school feeding programme, suspends Benue, Niger officials (Find Out Why) ! THE Federal Government on Thursday said that it has spent N49 billion on feeding of pupils in public primary schools across 24 states of the country in the last two years. The government also said that some officials of the programme in Niger and Benue States have been suspended for alleged fraud practices and that the officials were currently under investigations for possible prosecution. The Special Adviser to the President on National Social Investment Programme (NSIP) Mrs. Mariam Uwais who disclosed this while briefing journalists in Abuja also said that mechanism has been put in place for provision of quality standards and that the cooks were all trained on hygiene. According to her a total of N220 billion has been released within the period for the implementation of the four major components of the programme which are N-Power, NHGSFP,NCTP and GEEP and that there was a monitoring process which has involved the communities where the schools are located. She said that the Federal Government budgeted N500 billion for the 2016 fiscal year and the same amount in 2017 but about N140 billion was released in 2017 while N80 billion was accessed by the NSIP in 2016. She explained that the NSIP which was created in 2015 by President Muhammadu Buhari-led administration was officially launched in 2016 to deliver social economic support to disadvantaged Nigerians across the country. Mrs. Uwais further explained that about 8.596 million pupils were currently being fed by the federal government in 46,247 public primary schools in 24 states of the federation, adding that through the National Home-Grown School Feeding Programme, 90,670 Nigerians have been engaged and empowered as cooks while over 100,000 local farmers have also been linked to the programme to supply locally sourced farm produced. She noted that government has suspended some officials of the programme in Benue and Niger States because some of them have taken money without the knowledge of government and even opened personal accounts where they had directed that some money for the programme should be lodged into, adding that those that were caught in the act were currently under investigations by the Economic And Financial Crimes Commission (EFCC). She further explained that the objective of National Home-Grown School Feeding Programme was to provide one nutritious, balanced meal each school day to 5.5million pupils in classes to One to Three in the public primary schools across the a country. Mrs. Uwais said the programme has achieved 30 percent improvement in school enrollment in the country since its commencement.